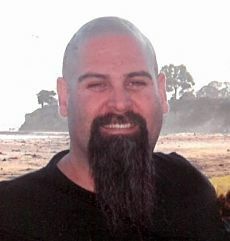 Dale Patrick Sullivan, 41, of Santa Barbara, CA, passed away suddenly on Friday, October 16th. He was born in Santa Barbara on June 17, 1974 to Sylvia (Sears) Sullivan and David Sullivan. Dale attended local schools, from Monte Vista through San Marcos. He worked as a journeyman carpenter and took great pride in his work as a foreman on large-scale construction sites in the Los Angeles area. Dale loved being around people and sharing a good laugh. He had a wonderful sense of humor, was an excellent cook and a faithful fan of the Steelers football team. Dale was welcomed into the arms of his father, David, who preceded him in death many years ago. He is survived by his daughter Hailey and son David Sullivan. He loved his children dearly, and was immensely proud of them. He is survived by his mother Sylvia Sullivan, his brother Kyle Sullivan, and sister-in-law Anna Rodriguez Sullivan. Uncle Dale will be missed by his nephews Jonathon Rodriguez and Patrick Sullivan, and niece Aaliyah Sullivan. He will be missed greatly by his cousins, Peter Moreno, Jerry Barnes, Michele Marquardt (Wade), Grace Smith, Erik Frierson (Claudia), Sean Ferries and Erin Ferries (Kimberly). Dale had a special place in his heart for his aunts, Elaine Sears, Lila Wilbarger (Ed), Maddie Smith (Larry), Bev Roddy, Anne Sears, and Jessielee Ferries (William). He will be together again with his cousin, Lisa Sears, and her father, Ted Sears, and uncle Allan Sears, who also preceded him in death. Dale leaves many wonderful, caring friends and extended family members, who are heartbroken at this sad time. He will be remembered as a good friend, always ready to help whenever he could. Dear Dale, we love you, and we will miss you always. Your struggles are over; may you rest in eternal peace. All are invited to attend a graveside service on Saturday, October 31 at 11:00 a.m., Calvary Cemetery, 199 N. Hope Ave., with a celebration of Dale’s life to follow at Stevens Park, 258 Canon Dr., Santa Barbara.